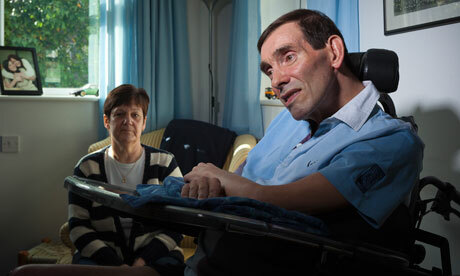 Updated – Tony Nicklinson, one of the two claimants in this case, died on 22 August 2012. This is Richard Dawkin’s battle cry in response to the recent High Court rejection of the challenge by locked-in sufferers to the murder and manslaughter laws in this country that have condemned them to an unknowable future of suffering. As explained in my previous posts, Nicklinson, who suffered a catastrophic stroke in 2005, argued for an extension to the common law defence of ‘necessity’ for murder because the alternative – forcing him to stay alive – is worse. His lawyers also submitted that the government is in breach of his Article 8 right to ‘privacy, dignity and autonomy’, a right he cannot exercise independently because of severe disability. The court rejected the “bold” submission, stating that there was no precedent anywhere in the world and such socially controversial changes were only for Parliament. But the courts can’t keep ducking away from the problem, because Parliament is never going to address this issue. Why? Because, as Dawkins points out, once again, religion turns out to be the major culprit. Every attempt in the House of Lords “to do something about the right to seek professional (or even amateur) assistance in dying when you are too incapacitated to kill yourself” has crashed and burned, despite huge public support for reform in this area. In opinion polls, for years, more than 80% have supported this change in the law, but every attempt at a right-to-die reform has been sabotaged by the large religious lobby, galvanised by Care Not Killing [an intervenor in the Nicklinson case]. The red benches, heavily stacked with the religious, including 26 bishops, saw off the last bills. As Toynbee observes, Care Not Killing lobby has threatened MPs with retaliation from all the faiths in their constituencies. This will no doubt kybosh former lord chancellor Lord Falconer’s attempt to introduce a private member’s bill for the Lords in January for an even more modest solution to this abominable situation: to allow those with a diagnosis of death within 12 months to ask for a lethal prescription. The High Court had its hands bound by the precedent set by the House of Lords in Pretty and Purdy. But why are our appellate courts so diffident on this score, when they think nothing of interfering with Parliamentary sovereignty over the control of our borders under the Human Rights Convention? And ground breaking precedents have been set before, arguably in areas exclusively in parliament’s jurisdiction. Remember Anisminic? The case went to the Lords in 1968, when judicial deference was still at its height. Nevertheless their Lordships ruled that where a public body makes any error of law that effectively renders its decision a nullity and that a statutory exclusion clause does not deprive the courts from their jurisdiction in judicial review unless it expressly states this. A statutory exclusion clause, mind, written by democratically elected parliament, specifically to exclude the supervision of the courts. Or, more recently and pertinently to this case since it involves discrimination, the case of Ghaidan v Godin-Mendoza  UKHL 30 where the House of Lords ruled that the relevant provisions of the 1977 Rent Act treats the survivors of homosexual relationships less favourably than survivors of heterosexual relationships. Since there is no rationale or ground for so doing, the surviving tenant of a long term homosexual relationship suffered infringements of his rights under articles 8 and 14 of the Convention when the landlord availed himself of the legislation to terminate the tenancy. Section 3 of the 1998 Act requires that legislation is given Convention-compliant meaning where possible. Why would doctors prolong suffering by withholding medication when they know the patient is doomed to a terrible end without it? Besides, as all doctors know, they already engage in a similar practice. That involves giving overdoses of painkillers like morphine to terminal patients: overdoses that they know will kill them by stopping breathing. The euphemism it goes by is “reducing pain,” since doctors are bound to do that if they can. They ask a patient if he/she is in pain, and if the answer is “yes,” they give more morphine—often enough to cause death. But if they do that, why not reduce the pain by ending the suffering deliberately and permanently? It amounts to exactly the same thing. The truth is, this is a burden of responsibility that many doctors are inclined to resist. But that is not a good enough reason for allowing them to avoid it. After all in other areas – such as mental health – they are depriving people of important fundamental liberties sometimes by coercive means all the time. Such onerous duties are carried out routinely be the medical profession and comes with many checks and supervision by tribunals and the courts. There is no reason why such a duty should not extend to people in Nicklinson and Martin’s position and any doctor resisting this sort of responsibility should think twice before entering the medical profession. Polly Toynbee and Richard Dawkins ruin their case by making it an anti-religious Issue. There are 26 Bishops, out of 768 Peers, and 650 MPs. The Bishops have no veto. However, the views of the BMA, a secular organisation, which is opposed to assisted suicide, carry enormous weight with Parliament. Lofthouse, I think that comment was just too subtle. Harold Bramwell, Harold Eddleston, Harold Freeman and Harold Jackman (to name but a few)? And while I’m on, why are lawyers who are usually so careful about language (unlike journalists, who think their job is to abuse it) are so free and easy about the term “right to die”? The inventors of the term admit it’s a play on words, without any real ethical or legal basis. Why should i.e disabled individuals be forced to live against their will in an unwelcoming society? Society is not responsible for meeting the needs of all their members, and most “normal” people don’t care one way or the other about persons with Downes Syndrome, blindness or ADHD and would not employ them or accomodate them at cost to their own comfort or economic bottomline. Apparently, Mr Nicklinson refused food from the time the judgment turning down his assisted dying was passed; under the terms of a living will he signed up to in 2005, he refused any form of medical intervention such that when he contracted pneumonia it led inevitably to his death. The lesson to be learned from this sorry saga is to sign up your own living will and then you will not be forced to live a poor quality of life if you do not want to do so. The recent cases surrounding assisted dying will eventually lead to some form of permissive legislation being passed in due course, with clear safeguards to protect individuals and medical personnel. Watch this space……. In any case this parroting of the Richard Dawkins line is getting tiresome. There is no evidence beyond general hand-waving by Dawkins and Toynbee to suggest that Parliamentary opposition to euthanasia laws is driven by “religion”. It ignores, for example, that both the British Medical Association and the Royal College of Physicians are opposed to Euthanasia and backed the High Court’s decision in this case: http://bma.org.uk/news-views-analysis/news/2012/august/bma-backs-refusal-of-right-to-die-case. In any case, that does not provide a reason for the Supreme Court to subvert the will of Parliament and decide the matter for themselves. Religious groups are entitled to lobby and campaign for changes in and maintenance of the law just as much as the next group. The suggestion that the Supreme Court should, without heed for Parliament or precedent, just willy-nilly “set a precedent” ignores the fundamentally different nature of judicial and parliamentary decision-making, drawing in false analogies from a case such as Ghaidan. Even the most dogged euthanasia advocate accepts that any regime of legalisation would require systems of oversight, regulation and safeguards. Consideration would have to be given to the conscience rights of medical practitioners. Such a system would have to be designed very carefully, with patient research and consultation. That is not something the Supreme Court is very good at as it is not its function. Where it has ‘set a precedent’, as in Ghaidan and R v R, these have been in practice very small (in terms of implementation) reforms, effectively operating to iron out anomalous kinks in the law, rather than introduce wholly new principles with potentially wide-reaching effects. A major change in the law to introduce euthanasia is not something that a court is functionally good at doing, nor are judges the best placed to decide what precise changes should be made. Such a move would be constitutionally unsettling, even for many right-to-die advocates, usurping the authority of Parliament in deciding what is a massively controversial issue. As for this: “There is no reason why such a duty should not extend to people in Nicklinson and Martin’s position and any doctor resisting this sort of responsibility should think twice before entering the medical profession.” This is, frankly, as chilling as it is callous. One would rather think that it would be a reasonable accommodation to allow those doctors who don’t want to kill people to not have to. It seems daft to suggest that those who want to join a profession primarily dedicated to saving lives should reconsider if they would rather not have to kill people. To me this post reads: while in principle this decision should be left to Parliament, I don’t agree with Parliament’s decision on the matter. This does not seem like a sensible, let alone democratic, constitutional proposition. Wiltshire Police said the force was not investigating Mr Nicklinson’s death. Nita: you are right and so am I. History proves that we all have to be very careful about who we put into positions of societal power. The Nazis effectively removed all human rights starting with the Neuremberg Laws of 1933 which went through a parliamentary process. This simply underlines the need for us all to act carefully when electing people into positions of authority. The judiciary may be able to act as a thin red line for a while but even they cannot withstand a determined authoritarian government. There is nothing at all intrinsic about human rights. In the US, the Republicans are now zeroing in on Roe v Wade. If they succeed, women’s abortion rights will be removed or heavily circumscribed. Many of the more intrusive laws passed in the so-called “war against terror” have also diminished our human rights. As Churchill once said, “The price of freedom is eternal vigilance” for every individual citizen. fleurblack’s remarks about human thumbs proves the opposite, i.e. that we are a unique species in this regard and Professor Raymond Tallis has carried out research into this very topic in “The Hand: A philosophical inquiry into human being” (2003), if fleurblack would like to pursue the topic more intelligently. No other primate possesses this facility. the simple fact that a fit human being can touch thumb to all the fingers in turn and also touch thumb to second, ring and little fingers over the first, then two then three shows that evolution is nonsense as if it were true there would be many otheranimals with such dexterity and the brain programming necessary to allow such dexterity. P.S….it seems Dawkins has hijacked yet another issue and turned it into a simplistic religious vs atheist debate – I just wish the Bishop Basher would accept that he doesnt speak on behalf of all atheists on this issue ..particularly the millions who choose NOT to join the star-studded array of members at the Atheist Society – by virtue of its celebrity membership, it undoubtedly possesses a lobbying power that , rather than accurately reflecting the strength of its arguments, mainly reflects the ease of access it has to national broadcast media. This is turning into one of the more lively recent topics. It must be the Dawkins Effect. To respond to a number of the comments above, there are at least 3 US states and 3 European states where assisted suicide is legally allowed. The experience there – as someone else pointed out – is people experiencing life-quality-diminishing conditions usually hang on to life longer than those who feel forced to make and take earlier action to bring their lives to an end. I am sorry to learn of the experiences of Elaine Branwell and members of her extended family. It was not my intention to upset her in any way. I do support the principal of individual choice as to life and death. We know that the so-called sanctity of human life is simply not true. One look at human history tells us that there have been times – some quite recently – when the apparent natural rights principles of life have been exposed as Bentham predicted as “nonsense on stilts”. The only rights we have are those we collectively award ourselves, which is why they have to be enshrined in our system of law, with Parliament providing the greater certainty of any such guarantee, even if we do see very occasional cases like Anisminic, where retroactivity was arguably the key feature of the case and attracted most comment and criticism. It was not me but Jerry Coyne who made reference to the use of pain-killing opiates effectively and clinically to end life. The Falcon Report was commissioned quite some time ago; it might be a good idea for one of the opinion polling organisations to carry out up-to-date polling research into current public attitudes towards assisted dying. I think Nita’s opinion of Richard Dawkins’ scientific credentials is unkind. Is it not a fundamental aspect of individual freedom that we all retain a choice over both life and death matters? We – as a species – have battled hard against scarcities in nature and against human enslavement down the millenia so today we can live freely in a modern day society. Religious attitudes generally hold back progress but even they eventually yield to popular opinion on almost any matter. ..in some countries, at some points in history, this view has left ethnic Jews and the disabled in a ‘ no right to life at all’ position, by collective award of government…. The courts have sufficient legal precedence and justification to refuse the application (Diane Pretty and Purdy, Bland et al) and the ECHR has ruled that the right to life do not include the converse when applied to a third party. It has consistently been stated that it is a matter for legislation, parliament. We all have the right to suicide without retribution since the Suicide Act and at the very least those people who want to die can refuse nourishment. The courts have confirmed this and against forced feeding as well as the principle of withdrawal of medical treatment. These options are open if a person truly has had enough. To die is not an easy thing for most of us therefore the personal act of doing so confirms our autonomous will in accordance with the law. It is cowardly to ask another to do it for you, even as a “professional” duty to alleviate suffering. To shift the responsibility is unfair. Perhaps those that support such a thing might think about there own responses to it and those closest to the person subject ask if they are prepared to administer the lethal dose ??. The guideline (CPS) for assisted suicide are clear and allowable, giving ample leverage for argument and application against prosecution in the appropriate circumstances without the dangers that the police, CPS, courts and others are concerned with. It is not a route we want to take because there are 100,000 elderly persons “suffering” and others in circumstances equally open to such action for reasoned and emotional justification. Life throughout all ages and cultures has been sacrosanct. While I agree it is a matter for parliament (though if Parliament continue to ignore the issue, I believe it should become one for judicial intervention) I simply cannot agree that asking for assistance is cowardly. As the Nicklinson case shows, many individuals who have fought for this right in our courts are often not in a position physically to help themselves, and self starvation is a prolongued, painful and therefore highly unattractive method of suicide that could take days and possibly weeks. Mike – no one (leastways not I ) is suggesting suicide is cowardly in these cases. Starvation isn’t painful, its performed whilst you are (we are told) unconcious , or ‘terminally sedated and dehydrated) – if it isn’t painful, why have so many NHS ‘palliative care’ units practiced ‘terminal sedation’ on the elderly without their consent and argued that it is painless and ‘a good death’? Agree with Tim and John – I’m not remotely religious, but having my own father murdered in front of me against his wishes, and spent almost 5 years being shunted between a coroner (“he was old anyway, and we dont have the money for an inquest”), the police (‘you’ll have to ask the coroner’), the GMC (use NHS complaints system or the police), in a fruitless quest for an investigation by the state, I have seen how easy it already is to terminate lives with or without consent, and do not want abuses further aided by the state. This case has frankly become tedious – as pointed out by John, he already has a morphine overdose at his disposal – all he needs to do is keep complaining of pain. Added to which, if Richard Dawkins was made a ‘close friend’ by this chap, current UK guidelines would not see him prosecuted for escorting him to Switzerland. It is biased, statistically meaningless, and of scientifc standard one only expects from Ian Duncan Smith on unemployment figures. The data is atrocious yet the extrapolations made from it are used by the assisted suicide lobby to suggest that ‘the majority’ of people with ‘terminal ‘ diagnoses support assisted euthenasia…I am staggered that Richard Dawkins validates such ‘research’, but then, he is a coffee table book writer, rather than a scientist…. Whatever one’s views on the right to die, it seems to me the Court is right to say that this is a matter for Parliament. It is a little feeble to identify religion as a ‘culprit’ as those with religious views are as entitled to be represented in this debate as any other. And that surely is the point; Parliament is the forum for continued debate about a change that would have such profound consequences. Those with strong views on the issue must, I’m afraid, continue to lobby using the normal avenues in a modern democracy. Why does John D think it is a small number of individuals like Mr Nicholson? I watched my mother determinedly starve herself to death some 18 months after a stroke, by no means as catastrophic as his, but which removed her autonomy. The doctor said that her kidneys should fail. They did not. Her ligaments shortened; she was in a great deal of pain from this, and resentful of what she had to do. My aunt was revived twice during an inefficient operation which left her immobile.For 12 years she complained her wishes had been ignored, until she died at over a 100 years. My father did not die quietly of a terminal cancer. Nor did elderly friends, or others in my extended family, or in friend’s families. Could it be that a good end is now a myth, or perhaps it was always so? It is arrogant of those not afflicted to ensure even one person’s death comes only after extended and useless suffering which that person despairingly wants to avoid. What a Godless world it is, if leaving it that way, can be justified. There is no such thing as a ‘right to die’ as long as there are ‘signs’ of life in which to communicate or portray one as a living human being, any attempt to whittle down or usurp this sanctity is an attempt to play god. Human life is absolute and beyond question. Suicide is legal in the UK! The question “whose life is it anyway?” was answered years ago as “the person living it” – as long as that person is able-bodied! This appears to be the one case where it is illegal to help a disabled person achieve something that would be legal if they were able-bodied! The point of this case was that it is illegal to assist in a suicide – the objections are exclusively based on the potential for abuse (which remains widespread), and the move towards giving doctors a ‘duty’ in law to do something they have a personal objection to. As a fellow humanist, I find myself in the unusual position of not agreeing with Richard Dawkins. I believe the judges were right: it is up to Parliament to decide the law on all important matters. While I agree that the Bishops Bench and other similarly-minded individuals in both Houses represent an obstacle to legislative development in this area, we should all remember that it was also Parliament which passed laws decriminalising homosexuality, legalising abortion and abolishing the death penalty. This makes it clear Parliament can legislate on controversial subject areas, which can also include assisted dying. While I sympathise with the small number of individuals like Mr Nicholson, I do also feel that we need a much longer-term approach on this and similar matters. As someone once said, “Hard cases make for poor law”. In this particular case, it is a fact that technology at least offers the possiblity of such sufferers being able to obtain exo-skeleton bodies in future, which can be directly connected to their brains so that they can obtain some degree of external mobility and movement in the future. This development will, of course, take some time to achieve but I believe there are already plans by Professor Miguel Nicolelis, a neuroscientist at Duke University in the United States to create brain interfaces – small devices that can read thoughts. One of his goals is to allow a paralysed person, wearing a robotic exoskeleton, which they will control by their mind, to take the first kick at the Football World Cup in Brazil in 2014. Potentially, such technology could at least offer someone like Mr Nicholson a partial relief from his present feelings of helplessness and of being a burden on his wife and others. I remain in support of assisted dying as a matter of individual choice, provided the choice is fully informed and is not taken as a result of manipulative external pressure. As I believe the Falcon Commission has suggested, we need two impartial doctors to recommend termantion of life – similar to the procedure employed in deciding upon abortion, which is legal. The law on abortion was passed by Parliament; I see no good reason why they cannot pass a similar law relating to assisted dying on demand.